Visual effects involving animals -- and human interaction with them -- have come a long way over the years, gradually getting closer and closer to realism with every Life of Pi and Planet of the Apes that comes out. For most, there's still a barrier separating the computer wizardry from buying into their authenticity, where audiences have to give a little slack to the filmmaking in order to believe whatever bizarre events are playing out on-screen, whether it's the simplicity of a tiger thrashing about on a boat or the complexity of talking apes leading a rebellion. In the second of a planned series of live-action adaptations of their animated works, Disney's The Jungle Book takes a bold, brave leap forward in this spectrum. Spearheaded by Iron Man and Zathura director Jon Favreau, no stranger to the fusion of digital and practical composition, this updated take on the whimsical tale of a boy growing up among wolves, cats, and bears (oh, my!) mesmerizes with its capability to make talking beasts seem surprisingly real and well-drawn amidst a bracing adventure of discovering where one fits in the world. This Jungle Book adapts from both Rudyard Kipling's collection of stories and from a few of the tweaks that Disney made in their animated version, both of which tell the tale of Mowgli (Neel Sithi), the feral "man-cub" raised in the jungle by wolves and by the black panther Bagheera (Ben Kingsley). While the boy struggles to keep up with the other wolf cubs in physical ability, he uses his human ingenuity and craftiness to get him along, a practice looked down upon by the pack's leader, Akela (Giancarlo Esposito), for not being part of their ways. Once word reaches a menacing tiger, Shere Khan (Idris Elba), that a human child resides with the wolves, Mowgli's life comes under attack, sending him into the depth of the jungle. During his flight from everything he's known from a young age, the boy encounters hardships and new acquaintances, from a crafty bear named Baloo (Bill Murray) to rambunctious foxes, snakes, and monkeys with unpredictable motivations, all leading him to learn where he and his unique circumstances belong in the wild. Mowgli speaks with the jungle's creatures in plain English, just as he does in the animated film, leading the animals to articulate the language as they would in a normal human conversation. Where the digital wizardry of talking animals in movies might have understandably rubbed some the wrong way in prior films, the computer-generated effects in The Jungle Book have achieved something rather noteworthy this time around, marrying verbal movements with the natural presence of the wild animals' appearances. Director Favreau and his team have crafted a living, breathing, speaking world here, both in the citizens of the jungle and the dazzling landscape of the land itself, approaching a projection of realism that requires far less suspension of disbelief than expected. From vigorous movement through verdant trees to something as simple as a large cats scaling the rocky terrain, the moments are rare where the cinematic illusion isn't preserved, an impressive feat considering the extensive visual effects from start to finish. Visuals are only part of the necessities in bringing to life such a vibrant and outlandish premise, as the wrong voices for the animals could've also created a disconnect. Such isn't the case with The Jungle Book, for the most part, as the vocal cast lends distinctive, seamless personalities to each of the individual animals, embracing the primal and persuasive and jovial attitudes one might expect from the species. Ben Kingsley channels a sympathetic, impartial gruffness into the panther Bagheera, while the likes of Giancarlo Esposito and Lupita Nyong'o continue to flex their voiceover muscle as Mowgli's wolf pack. Idris Elba's turn as the villainous Shere Khan, dominant yet wounded in his menacing persona, might make it through this theatrical season as the best villain of the year. Others are more recognizable: Scarlett Johansson's low, velvety tempo can be pinpointed as the python Kaa, but the hypnotic fluidity of her performance works wonders for the role, as does the idiosyncratic registry of Christopher Walken as a colossal monkey king. Despite my adoration for Bill Murray, however, his charisma struggles to fit inside the body of the bear Baloo, enjoyably buoyant but overtly identifiable. That's a lot of intangible movie-making magic surrounding newcomer Neel Sithi, yet, despite that, he brings empathy, dedication, and wide-eyed wonder to the adventures of Mowgli throughout the jungle. While showing signs of inexperience, his strong youthful performance goes a long way toward enriching the theme surrounding a human existing in the world of animals, where his use of tools and ingenuity to supplement his lack of raw instinct and physical prowess becomes a complex backbone for the story. Neel Sithi's performance has depth and adaptability to it, fleshing out Mowgli as a distinct personality instead of a prop moving through the computer-generated apparatus, lending credence to the emotional bonds he builds with the wolfpack and, in different degrees, with Bagheera and Baloo. 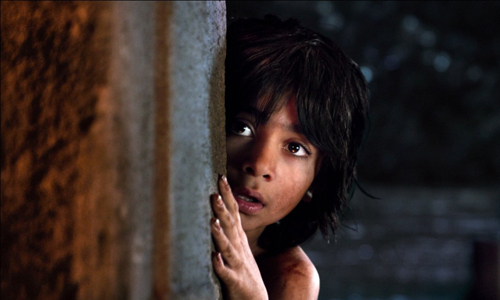 Mowgli endures a lot of emotional trials throughout the jungle's decisions about how to handle the "man-cub", about whether he belongs with his kind or should stay with another species, which shapes into an involving coming-of-age yarn that's kept under control by the fortitude and youthful responses brought out of Neel Sithi. 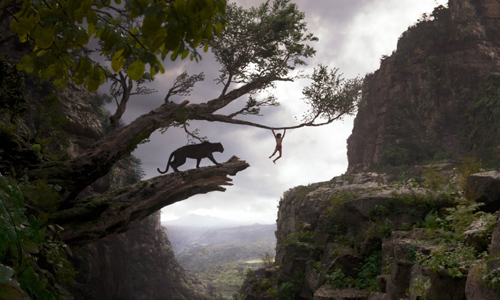 With Favreau's expertise in the Marvel universe and other blockbusters as the driving force pulling it all together, The Jungle Book quickly takes shape as an energetic and spellbinding odyssey that shows reverence both to the spirit of Kipling's work and to the vibrancy of Disney's original animated film. Intense fights among animals -- arguably a tad too intense for the younger crowd -- and cleverly-placed musical numbers weave together inside Mowgli's dangerous flight throughout the jungle, shining a light on both the intensity of the young human's surroundings and uplifting it all with just the right amount of effervescence befitting the House of Mouse. The adventure never really stops as it strides through flashbacks, stampedes, and raging fire, holding onto that largely family-friendly energy until a bold and consequential finale that smartly brings together the film's ideas of fitting in and of human ingenuity. Sure, it's a tad outlandish, even for a film with talking animals, but for Favreau and his team to bring it so close to photorealism and authentic emotionality within the setting is quite a feat.